56:1.4 Pure energy is the ancestor of all relative, nonspirit functional realities, while pure spirit is the potential of the divine and directive overcontrol of all basic energy systems. And these realities, so diverse as manifested throughout space and as observed in the motions of time, are both centered in the person of the Paradise Father. In him they are one—must be unified—because God is one. The Father’s personality is absolutely unified. 56:3.2Paradise spirit realities are likewise one, but in all time-space situations and relations this single spirit is revealed in the dual phenomena of the spirit personalities and emanations of the Eternal Son and the spirit personalities and influences of the Infinite Spirit and associated creations; and there is yet a third—pure-spirit fragmentations—the Father’s bestowal of the Thought Adjusters and other spirit entities which are prepersonal. 56:3.6 Spirit must always and ultimately become threefold in expression and Trinity-unified in final realization. Spirit originates from one source through a threefold expression; and in finality it must and does attain its full realization in that divine unification which is experienced in finding God—oneness with divinity—in eternity, and by means of the ministry of the cosmic mind of the infinite expression of the eternal word of the Father’s universal thought. 56:4.1 The Universal Father is a divinely unified personality; hence will all his ascendant children who are carried to Paradise by the rebound momentum of the Thought Adjusters, who went forth from Paradise to indwell material mortals in obedience to the Father’s mandate, likewise be fully unified personalities ere they reach Havona. 56:4.2Personality inherently reaches out to unify all constituent realities. 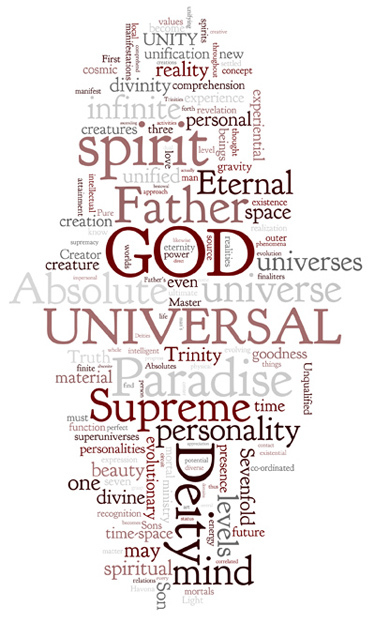 The infinite personality of the First Source and Center, the Universal Father, unifies all seven constituent Absolutes of Infinity; and the personality of mortal man, being an exclusive and direct bestowal of the Universal Father, likewise possesses the potential of unifying the constituent factors of the mortal creature. Such unifying creativity of all creature personality is a birthmark of its high and exclusive source and is further evidential of its unbroken contact with this same source through the personality circuit, by means of which the personality of the creature maintains direct and sustaining contact with the Father of all personality on Paradise. 56:7.2 As the components of a local universe are progressively settled in light and life, God the Sevenfold is increasingly made manifest. Time-space evolution begins on a planet with the first expression of God the Sevenfold—the Creator Son-Creative Spirit association—in control. With the settling of a system in light, this Son-Spirit liaison attains the fullness of function; and when an entire constellation is thus settled, the second phase of God the Sevenfold becomes more active throughout such a realm. The completed administrative evolution of a local universe is attended by new and more direct ministrations of the superuniverse Master Spirits; and at this point there also begins that ever-expanding revelation and realization of God the Supreme which culminates in the ascender’s comprehension of the Supreme Being while passing through the worlds of the sixth Havona circuit. 56:7.9 Nevertheless, we deem that the perfected superuniverses will in some way become a part of the Paradise- ascension careers of those beings who may inhabit these outer creations. It is quite possible that in that future age we may witness outer-spacers approaching Havona through the seven superuniverses, administered by God the Supreme with or without the collaboration of the Seven Master Spirits. 56:8.1 The Supreme Being has a threefold function in the experience of mortal man: First, he is the unifier of time-space divinity, God the Sevenfold; second, he is the maximum of Deity which finite creatures can actually comprehend; third, he is mortal man’s only avenue of approach to the transcendental experience of consorting with absonite mind, eternal spirit, and Paradise personality. 56:8.4 All creational phenomena are reflective of antecedent creator-spirit activities. Said Jesus, and it is literally true, “The Son does only those things which he sees the Father do.” In time you mortals may begin the revelation of the Supreme to your fellows, and increasingly may you augment this revelation as you ascend Paradiseward. In eternity you may be permitted to make increasing revelations of this God of evolutionary creatures on supreme levels—even ultimate—as seventh-stage finaliters. 56:10.1 As the worlds settled in life and light progress from the initial stage to the seventh epoch, they successively grasp for the realization of the reality of God the Sevenfold, ranging from the adoration of the Creator Son to the worship of his Paradise Father. Throughout the continuing seventh stage of such a world’s history the ever-progressing mortals grow in the knowledge of God the Supreme, while they vaguely discern the reality of the overshadowing ministry of God the Ultimate. 56:10.2 Throughout this glorious age the chief pursuit of the ever-advancing mortals is the quest for a better understanding and a fuller realization of the comprehensible elements of Deity—truth, beauty, and goodness. This represents man’s effort to discern God in mind, matter, and spirit. And as the mortal pursues this quest, he finds himself increasingly absorbed in the experiential study of philosophy, cosmology, and divinity. 56:10.3 Philosophy you somewhat grasp, and divinity you comprehend in worship, social service, and personal spiritual experience, but the pursuit of beauty—cosmology—you all too often limit to the study of man’s crude artistic endeavors. Beauty, art, is largely a matter of the unification of contrasts. Variety is essential to the concept of beauty. The supreme beauty, the height of finite art, is the drama of the unification of the vastness of the cosmic extremes of Creator and creature. Man finding God and God finding man—the creature becoming perfect as is the Creator—that is the supernal achievement of the supremely beautiful, the attainment of the apex of cosmic art. 56:10.15 Even truth, beauty, and goodness—man’s intellectual approach to the universe of mind, matter, and spirit—must be combined into one unified concept of a divine and supreme ideal. As mortal personality unifies the human experience with matter, mind, and spirit, so does this divine and supreme ideal become power-unified in Supremacy and then personalized as a God of fatherly love. 56:10.17 Universal beauty is the recognition of the reflection of the Isle of Paradise in the material creation, while eternal truth is the special ministry of the Paradise Sons who not only bestow themselves upon the mortal races but even pour out their Spirit of Truth upon all peoples. Divine goodness is more fully shown forth in the loving ministry of the manifold personalities of the Infinite Spirit. But love, the sum total of these three qualities, is man’s perception of God as his spirit Father. 56:10.19 These meaningful reality values of divinity are blended in the Father’s relation with each personal creature as divine love. They are co-ordinated in the Son and his Sons as divine mercy. They manifest their qualities through the Spirit and his spirit children as divine ministry, the portrayal of loving mercy to the children of time. These three divinities are primarily manifested by the Supreme Being as power-personality synthesis. They are variously shown forth by God the Sevenfold in seven differing associations of divine meanings and values on seven ascending levels.